BARCELONA, SPAIN - MAY 21 2011: Spectators tourists and locals near the Arc Triumph in Barcelona, Spain on May 21, 2011. Parc de la Ciutadella Arc de Triomf. hd00:13(Timelapse) Traffic congestion at the Arc de Triomf, May 21, 2011 in Barcelona Spain. hd00:15Barcelona, Spain - April 20, 2016: People walking by in the Arc de Triomf, an arch which served as the main access gate for the 1888 Barcelona Universal Exposition, Spain's first World Fair. 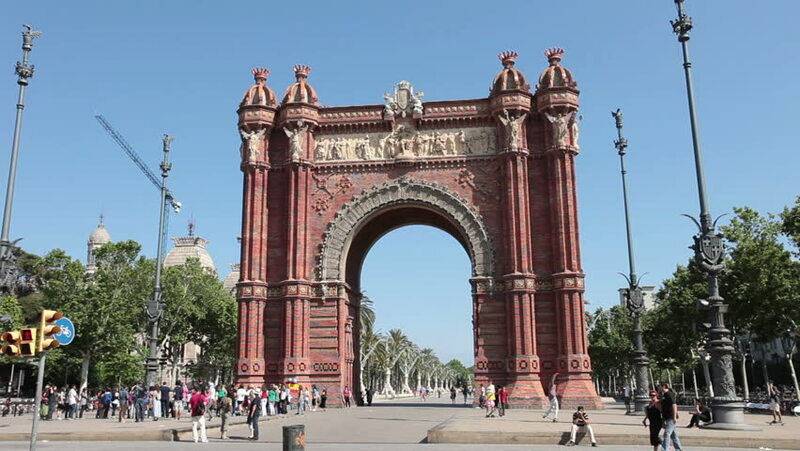 hd00:10Barcelona, Spain - April 20, 2016: Hyperlapse (timelapse) of the Arc de Triomf, an arch which served as the main access gate for the 1888 Barcelona Universal Exposition, Spain's first World Fair. 4k00:28BARCELONA, SPAIN - SEPT 2014: Barcelona Spain Arc De Trimof traffic. Arc of Triumph from up the street. Traffic and bicycle riders and pedestrians in middle road strip. Built in 1888.